The recommended diet varies from breeder to breeder, however most will suggest a well balanced diet, low in protein less than 26%. Great Danes may be predisposed to certain health problems such as Hip and Elbow Dysplasia, Von Willibrands Disease, Wobbler Syndrome, Eye/hearing abnormalities (especially in predominately white dogs), Sports and/or weight injuries like cruciate ligament tears, Osteosarcomas, Thyroid abnormalities, Bloating and stomach torsion, Irritable bowel syndrome, Happy tail injuries and Cardiomyopathy and other heart conditions found in Giant Breed dogs. Puppies and young adults can develop growing or bone problems which are sometimes associated with an improper diet. The most negative aspect of the breed is a short life span. 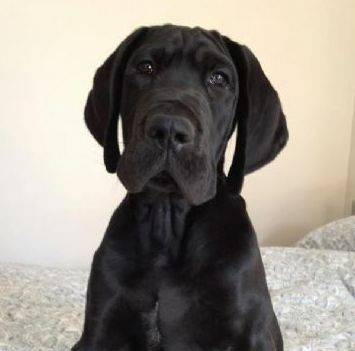 What type of Temperament should a Great Dane have? A Great Dane should be friendly and outgoing. Great Danes are often referred to as Gentle Giants, but like all dogs require training.